Bazelmans AVR, a Dutch AV rental company, will be one of the first users of the Meyer Sound LYON linear sound reinforcement system. 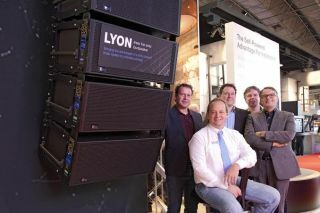 The LYON sale to the company, closed during the ISE 2014 trade show currently in Amsterdam, includes 40 LYON linear line array loudspeakers, 22 1100-LFC low-frequency control elements, and a Galileo Callisto loudspeaker management system, in addition to RMServers for loudspeaker monitoring. (From left to right): Eric Mattijsen (AEM), Scott Gledhill (Meyer Sound), Roland Mattijsen (AEM), Aart Habraken (Bazelmans AVR), and Wiljan Bazelmans (Bazelmans AVR)Making its tradeshow debut at ISE 2014, LYON is the newest member of Meyer Sound's LEO Family. According to Meyer Sound, LYON comes in a more flexible and compact package than the LEO-M line array loudspeaker, while retaining the same exceptional headroom, accurate sound reproduction at any operating level, and optimized rigging for streamlined set-up. Designed for medium-to-large-scale applications, LYON is available in two variants: the LYON-M main line array loudspeaker for main arrays, and the LYON-Wwide-coverage line array loudspeaker for downfill and outfill applications. "We want the best experience for our customers, not just once but every time," continues Bazelmans. "We decided to step up from other loudspeaker brands to Meyer Sound some years ago, and we have never looked back. We are thrilled to become one of the first suppliers of LYON, which is sure to play a key role in the future growth of our company." MICA and M'elodie line array loudspeakers, UPQ-1P and 1100-LFC loudspeakers, UPJ-1P and UPJunior VariO loudspeakers, and 500-HP, 600-HP, and 700-HP subwoofers. Netherlands. The company's expertise and client base encompasses corporate events, civic celebrations and festivals, and concert and festival systems for musical performances that range from classical to electronic dance music.